'VELOUR: Collected Issues 1-3' is available in hardcover now. Iconic drag performer and artist Sasha Velour has always been about creating a platform to uplift her community. As such, using her experience as a creative director, Velour created a playfully designed but instructive magazine, VELOUR: The Drag Magazine in 2015, as a means to spotlight a diverse cadre of rising and established multidisciplinary queer artists. Velour curates and edits the semi-annual, ad-free magazine with her partner Johnny Velour; it functions essentially as a reliable artistic document, matching drag innovators with visual artists and writers to create impactful pieces about the power, beauty, and purpose of drag. VELOUR is multi-purpose: It's engaging shared in the community; beautiful enough to be a collector's item; and scholastic enough to be taught in classrooms. 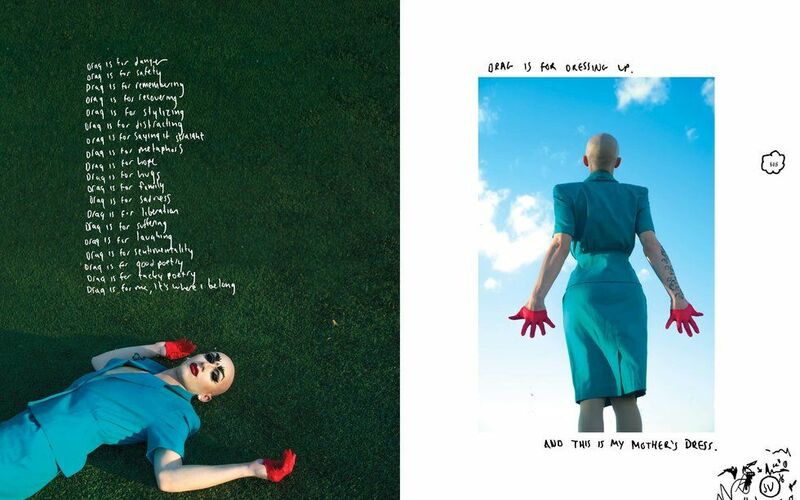 The magazine would also become an inspiration for Velour's much-beloved regular gig, Nightgowns, her live, Brooklyn-based performance series that also began in 2015. "In a sense, my entire drag career has grown out of VELOUR: The Drag Magazine," she tells PAPER. "Quite literally, in fact, because the book release party for the first issue was the show that eventually became Nightgowns. In the early days, the show had a dual purpose; a Nightgowns live show was the perfect scheme to sell magazines to tipsy bar patrons! When you're a drag queen, it's all about making opportunities for yourself." On the magazine's overall mission, Velour explains that the point of it has always centered the history and intersectional diversity of drag, as the art form's performers see it themselves. "Specifically, we wanted to tell stories about the amazing drag kings and many trans, AFAB [assigned female at birth], and non-binary drag artists who exist and always have existed alongside gay male drag queens," Velour says. "When we put that kind of representation on stage, booking shows [inspired by the magazine] that featured drag kings, AFAB queens, pageant performers, live singers, etc. all on one stage together, it kind of broke the mold!" And today, just in time for the holidays, the artist unveils a beautifully curated, full-color, 300-page hardcover edition of the first three collected issues of VELOUR, further elevating the source material's content into a stunningly original work of art (that also happens to make a fabulous gift). Above, find a range of Velour's favorite selections, spanning from drag sisterhood to fine art to activism. Preview and purchase the book, selling for $60, here. All images courtesy of Sasha Velour/House of Velour unless otherwise credited.